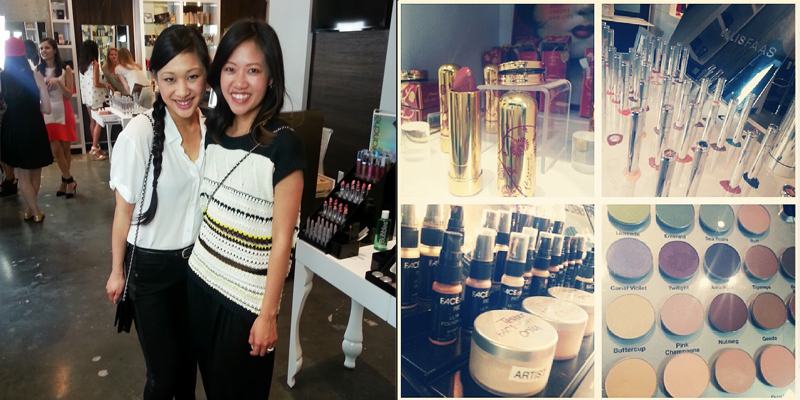 last week me and Fifi attended a beauty blogger event hosted by the Edward Sanchez Vanity Lounge in West Ave. We got to check out all the brands and goodies from all over the world that only they carry in town. While mixing with some of the best, and noshing on macarons from Petite Sweets wilst drinking champagne of course. The staff did some touch-ups and technique tips, and introduced us to some of the latest, including the oh so exotic bee venom masks. Gotta try that Rachel K CC cream next time too! so about this outfit. this sweater is one of those all time great finds from Forever21, you know you have some too, pieces you cannot believe is from there, and nobody else can either. Knit so well, open weave, and that sheer stripe? Sure it's nearly $30 which is getting on the high side for Forever 21. but he's perfect. Also these pants i've had forever picked up on a trip in Tokyo.. harem pants/ drop crotch.. cotton, and lightweight, plus slightly cropped. too much in one pant? no, nevar. I forget about these until vacation time each year. They're SUPER COMFY. and actually go well with tops.. i don't know why i don't wear them more often. these wedges need no introduction. black lacquer lanvin wedges. BY THE WAY - with We Wear Things rounding out it's 5th year anniversary I figured it was about time to add some new fashionables to the crew. Expect some posts from Fifi and Vinnie soon. They've got amazing and unique style that I admire and I think you guys will be inspired by too! Very relaxed look, you look so lovely. I am your new follower via bloglovin and Gfc. I love your blog so much! OMG! Looks like it was an awesome event love all the pics . Great top and shoes, this outfit was really well combined! Sounds like a really fun event! Congrats on your 5 years of blogging too! Cute sweater and congrats on your blogiversary! I NEED that ring in my life!! Gorgeous. That ring is from Forever 21! srsly! Why is it, that, when we reach a certain age, comfort is like... 1000% more important? But in your case, you manage to look amazing while being comfortable.